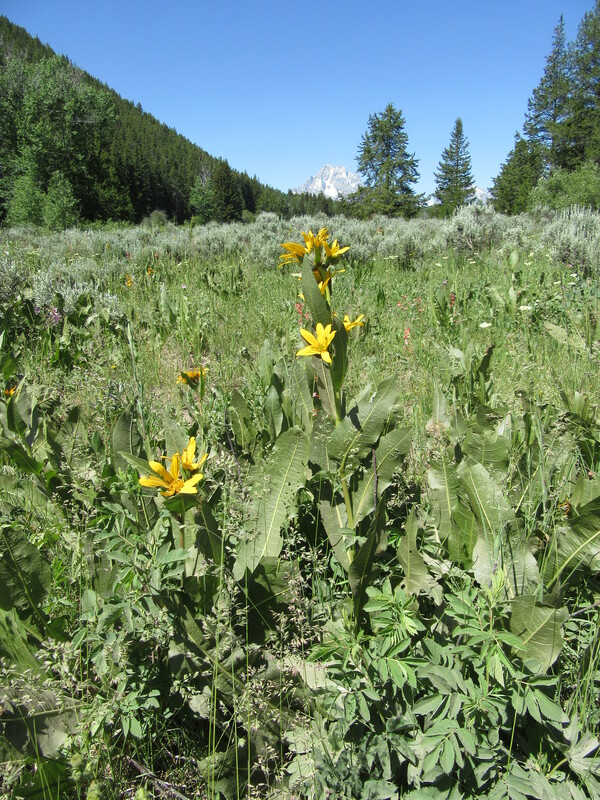 My friend Kristin Kauth and I recently did a wildflower tour of the Glacier/Yellowstone/Grand Teton National Parks. It was awesome! I have many photos to share with you in the coming weeks and months. 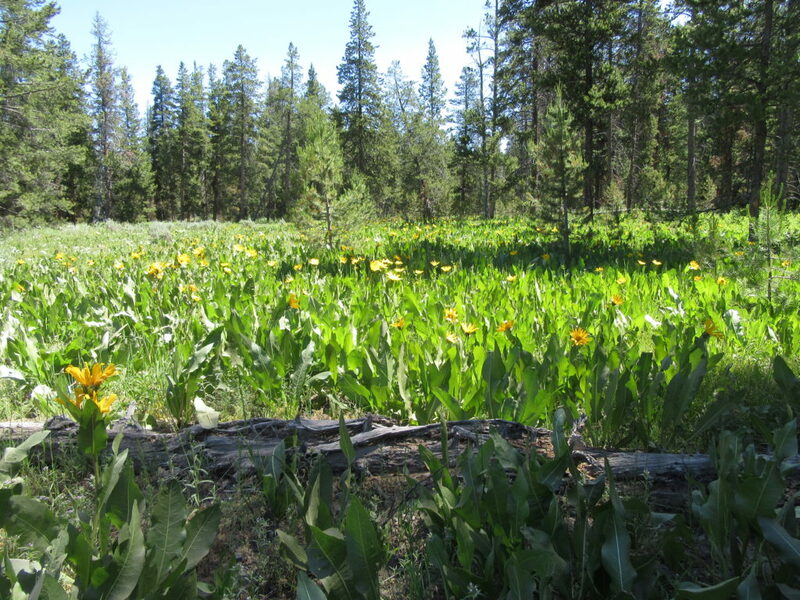 To our surprise we found similar species to Midwest wildflowers, but also found many new and exciting plants that grow bravely in these mountain ranges and sometimes in the most arid and alpine regions. I hope you’ll enjoy sharing our enthusiasm for this wildflower tour. Arrowleaf balsamroot (Balsamorhiza sagittata) was the most predominant species we found just about everywhere during this time of year. 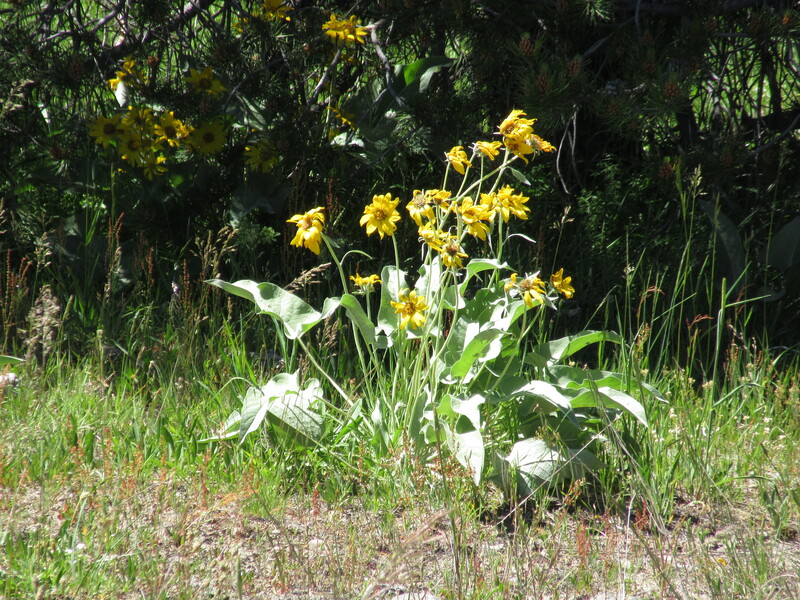 Arrowleaf balsamroot (Balsamorhiza sagittata) blooms in early spring in open, sunny areas in a variety of environments from foothills and meadows to pine forests and roadsides. Little Sunflower (Helianthella uniflora) prominently showed its blooms to the sun further south. Little sunflower (Helianthella uniflora). 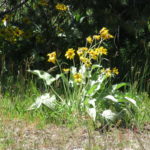 Grows in late June on hillsides and in open woods. Seen everywhere in the Yellowstone/Grand Teton National Parks, little sunflower (Helianthella uniflora) was a lovely compliment to the many pine species growing in these mountain locations. This photo was taken during the early morning sunshine. The previous day, during the shadier afternoon, all you could see was yellow from the many flowerheads. Photo taken at Willow Flats, Grand Teton National Park, Wyoming. Glad you liked my home state and parks. Did you find the sticky geranium? Hi! Tim — yes, we did. It was the first plant we recognized as being similar to a plant we have here in the Midwest. I plan to write a future post on it. Gee, I wonder how that geranium got it’s common name??? Uh-huh — it appears you want me to write my post earlier than planned, Tim. Sticky Geranium or Geranium viscosissimum got part of its name from the Greek word geranos, which refers to the long beaked bird known as the crane, because the seed pods of the geranium have long curved spikes. Here in Wisconsin we have wild geranium (Geranium maculatum) which looks very similar to the sticky geranium Geranium viscosissimum of Montana and Wyoming except the blossoms and leaves of the sticky geranium are substantially thicker and quite hairy compared to the wild geranium. 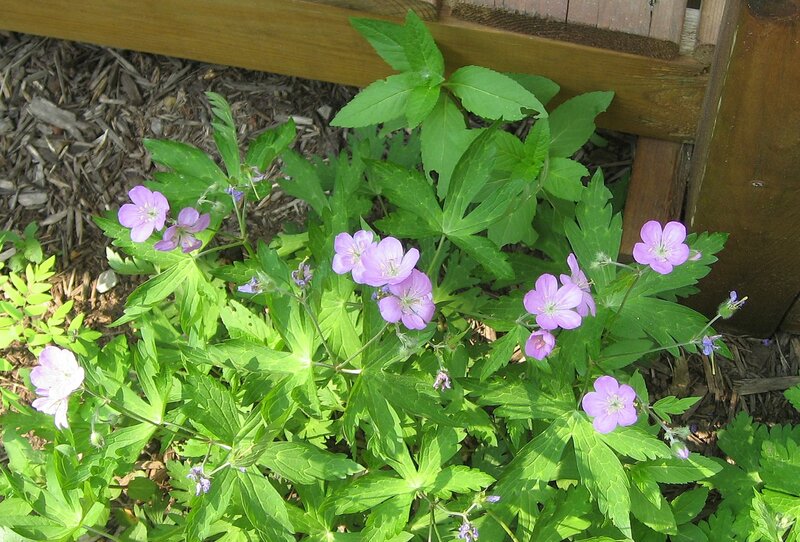 Also, the blooms of the sticky geranium are deeper purple in color than the lavender of the wild geranium. The word “sticky” refers to the carnivorous enzymes apparently produced by the plant which grows further northwest. The sticky hairs on the Geranium viscosissimum appear to have the capability to digest and absorb algal protein. More to come in a future post. I just came across this post – my daughter and I visited the same 3 parks June 13-23, 2016. We may have crossed paths! It was indeed a beautiful time and I also enjoyed visiting the “relatives” of the native plants that I have in Georgia. If you scroll down you can see links just to the wildflower posts. Looks like you and your daughter had a wonderful trip just like Kristin and I did. 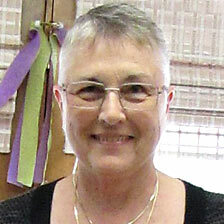 You have wonderful memories in your blog. I trust you are planning for your next trip via train. We’re looking forward to an Alaskan train trip in the future.